We teach classes for one reason. And that is to do just that, teach and share. 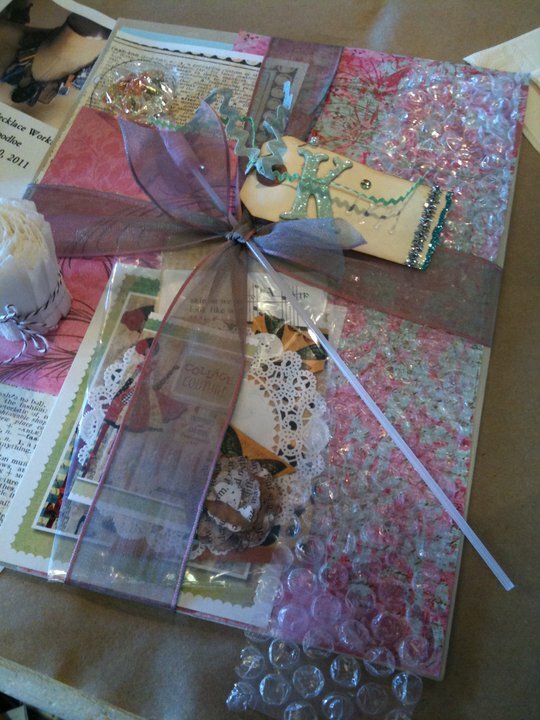 I was lucky enough to teach a class at a darling little store in Tustin last Saturday. This store is home to California's famed Glitterfest so enough said, it is girly, glitzy, pink, and fun! A few weeks back I saw a post on Facebook that showed a few of the people that signed up for this class and I must say, I went into a bit of panic mode. None other than Kim Caldwell who, if any of you follow her on Facebook or her blog, you know all about the fabulous events she puts on in Southern California. Always themed for the perfect girly get-aways, and everything from table decor to goody bags looks right out of perfectly styled magazines. So, it goes without saying, I had to step up my act here. I don't do cute and I don't do pretty, I just do. It's not because I don't want to, It's just that I'm not that great at it. Kim and her group of friends are used to pretty and I pushed myself to create pretty.Because my classes consist of canvas art, I never really pulled it all together in kit form. So pretty I did. I pulled all the paper elements together and simply tied it all together with a pretty bow. Of course, Sheryl, owner of Whimzy had the tables all prettied up so that made it all the easier for me. 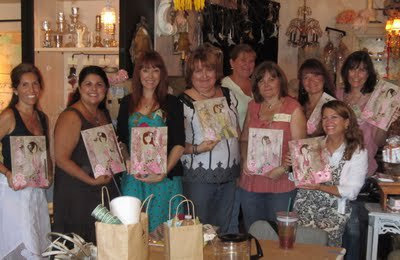 The class was so much fun with this group of pretties! They are a close knit group but they made me feel like I belonged. Their art turned out beautiful and a fun time was had by all. Thanks girls...you pushed me and stretched me and that's what I love most about teaching...what I learn from the students! Thank you for all your sweet words Julie. Your class was such fun - I learned so much and enjoyed all your pretty touches. Thank you for taking such good care of us! Looking forward to playing again! You did it! It looks very pretty to me! All the ladies seemed to look like they had a wonderful time! Love Kim! I hear what you're saying about "just doing," but for the record, I think your stuff is done prettily.